To an outsider, there are certain aspects of your business that are highly visible – the blog posts, web pages, products launches, social media updates etc. However, what about the behind-the-scenes side of things? 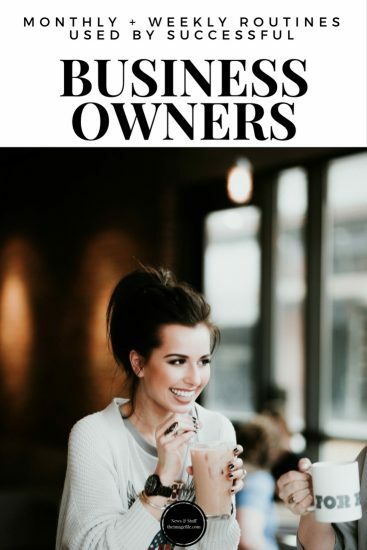 What routines do other successful business owners use to keep the business growing at a healthy rate, as well as keeping on top of everything that needs to be done? Running a successful business doesn’t mean you have to go at a hundred miles an hour every day. There are some simple monthly tasks you can do to propel your business forward and keep on top of vital information. The only way to truly know whether your business is growing is to take a look at the figures. If you lose track of your monthly earnings, then it’s impossible to make good, informed decisions for your business. So set aside some time, get a simple piece of software that works for you and take a look at the numbers! At the end of every month, take a look at how much you have earned. Note that number down in whichever software you choose to use. How does it compare to last month’s earnings? What had a positive effect? What should be repeated? What would you like to earn next month? Are there obstacles that could get in the way? People are only following your business, social media accounts or emails because they like or need what you’re offering. However, if you don’t share how your business can affect them, your potential customers will find someone else. I know you don’t want to be pushy, fake or sales-y, but try to interact and market your business to your customers. Make a note of how many times you’ve told people about your business or marketed your services this month. Now set a goal for next month. Google Analytics can tell you exactly which parts of your content your audience is most enthusiastic about. This information is really valuable as it will help you create a solid content plan for the coming month and give your audience more of what they love. If you haven’t already got a Google Analytics account then open one. Check your top 15 blog posts by clicking Behaviour > Site Content > All Pages. Write them down somewhere. Can you see a recurring theme amongst your popular posts? Are there any topics or post formats that readers seem to really like? Once you know what your audience enjoys you can start planning out future related content. The best way to ensure that you have a cohesive content plan is by creating monthly themes. This helps your content stay cohesive and gives your readers tonnes of value. Choose a content theme for next month and brainstorm ideas for blog posts, social media content, how your products and services are related etc. Track your goals and update your plan at the end of the month, noting down the pros and the cons. Your website and any web page that “sells” your services and products is a crucial part of your online presence. Give yourself some time to make small changes each month, to update information and see what works best for your customers. Review your web pages. Update them to make sure they’re current, accurate and giving clients the information they need. Now that you have your monthly tasks sorted, it’s time to look at weekly routines. These jobs shouldn’t take long but should keep you on top of your to-do list. I know this seems obvious, but worrying about your business or scrolling through social media isn’t the same as working on your business. If you want to get something done, then you need to do the work. Make sure you have everything you need when you start the job. Think about what you need to get done and identify the five things that absolutely must get done today. Most people overestimate the amount they can get done in a day. Sometimes there’s just too much on the to-do list or something takes longer than expected to complete. When you start planning things out, block out 1.5x the amount of time you think you will need. This will give you more of a chance to complete everything and leave you feeling accomplished at the end of the day. Review your calendar and to-do list. Then, schedule 1.5x the amount of time you think everything will take. If there is not enough time on paper then it probably won’t come to fruition in practice. Adjust your schedule accordingly, then end your day feeling accomplished. It’s important to reflect on your week so that you can work out what is worth investing more time and effort in. What does your intuition say? What do the facts show? At the end of your week, take 5 minutes to reflect. I don’t mean you have to sit there and meditate on the meaning of life but do a quick check of what went well, what got in the way and what you need to do next week.